When I left home, my mother gave me a few cookbooks. Amongst them was a diminutive volume called Paneer by Tarla Dalal. I had often seen my mother consult Tarla Dalal’s recipes. Tarla was a prolific cook and writer, and her books tried to capture practically every cuisine in the world for the Indian vegetarian cook, suitably modified for that palate and sensibility. Some of her recipes had become family favorites, like the one for Burmese Khow Suey. I couldn’t leave home without a volume by this venerable, sometimes idiosyncratic kitchen aunt. The Paneer book travelled with me through many years and during that time, there were only one or two recipes that I dared to make from it. But given my limited cooking repertoire, I made those recipes so many times that the book got increasingly tattered and splattered with food. I always felt an odd sense of pride when I looked at a familiar recipe festooned with wavy watermarks and bits of food. Here was a piece, albeit ragged and out-of-place in this sleek digital age, of what I considered to be my culinary history. 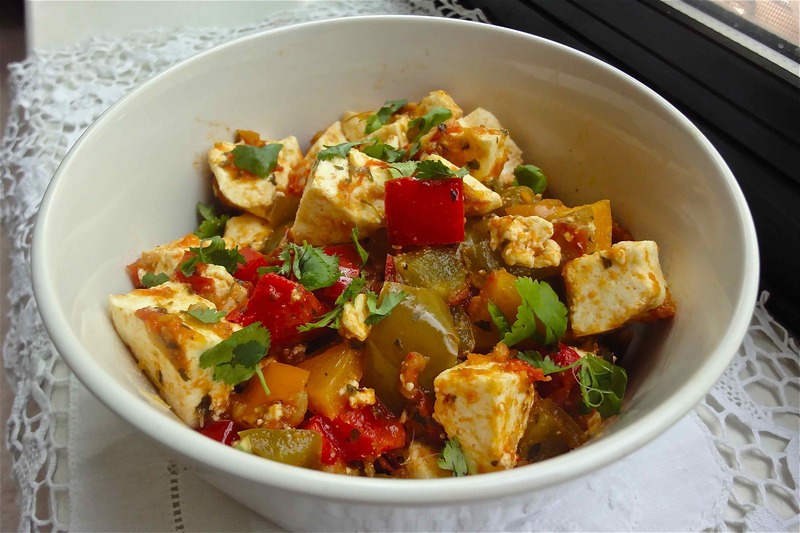 One of my favorite dishes in this book is a simple capsicum paneer stir fry. I’ve taken lots of liberties with the balance of the ingredients, but have retained Tarla’s basic cooking guidelines. It is an easy, satisfying dish that puts multi-hued bell peppers to good use. 1. First, pound the coriander seeds and the red chilli together. Keep aside. 2. Heat the oil in a pan. Add the garlic paste and cook on low heat for a few seconds. Add the capsicum and the pounded spices and cook for a half minute. Add the green chillies and ginger, and fry again for several seconds. Add the tomatoes and cook until the oil is released from the mixture. 3. With your palms, crush the kasuri methi and sprinkle into the dish. Add the salt. Cook for a few seconds again. 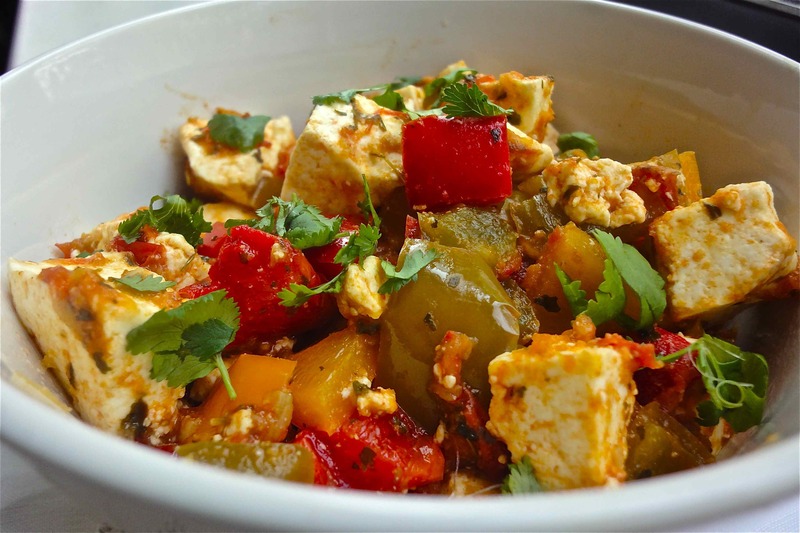 Toss the paneer with the vegetables. Cook for a few minutes. Garnish with coriander and serve hot with rotis or parathas and raita.